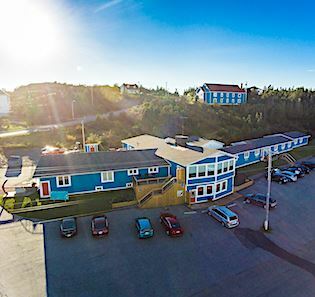 Situated on the ocean, the Anchor Inn Hotel offers uninterrupted ocean views from many of its rooms. Each room is large, tastefully decorated with local spruce floors, duvet blankets, free wi-fi and cable TV. Amenities include iron and ironing board, hair dryer and coffee maker. Choose from double, queen or king beds. The hotel has 22 rooms as well as 4 self-catering suites. Each room has its own en-suite bathroom. On-site restaurant, Georgie's has a menu with innovative meal choices and lovely ocean views. Captain's Pub is the place to unwind, enjoy a game on the big screen or experience a kitchen party or show in summer. 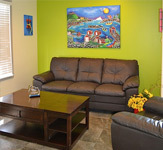 If you are looking for a friendly getaway in a quiet corner of Twillingate, we have just the place for you. Living room in one of the Hilltop Annex's one-bedroom suites. This site is developed and maintained by the Twillingate Islands Tourism Association (TITA).